The geometric mean of two positive integers and is . In this post, we are going to show the relationship between geometric mean and the relationships among the sides and altitude of a right triangle. each leg is the geometric mean of the hypotenuse and the segment of the hypotenuse adjacent to the leg. Let and be the legs of the triangle with hypotenuse . Let be the altitude of the triangle to the hypotenuse dividing the to segments and . First, we show that that the three triangles, , , and are similar triangles. since both of them equal . So, , , and are right triangles which all include an angle whose measure equal . 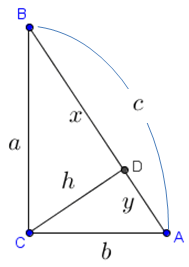 Therefore, these three triangles are similar. Since these three triangles are similar, their sides are proportional. It remains to show that and . which means that and that . These prove the Right Triangle Altitude Theorem..
why are there so many dollar signs??? Sorry, it was an error, i’m fixing it.